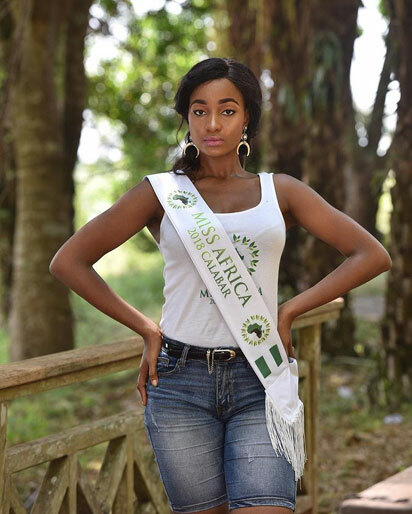 18-year old undergraduate of University of Nigeria, Chimamaka Nnaemeka, who hails from Idemili South, Anambra State, has emerged first runner-up at the just concluded Miss Africa pageant held at the Calabar International Convention Center, Cross River State. Chimamaka beat twenty three other contestants to emerge first runner-up at the pageant which was won by 24-year-old Miss Congo, Dorcas Kasinde, while 23-year-old Miss Zambia, Gladys Kayumba emerged second runner-up. Nigerians were admittedly very proud of Chimamaka’s outing and felt she maybe deserved the crown. In a chat with Potpourri the Miss UNN 2018 and Anambra representative at MBGN 2018 who expressed profound gratitude to God for her big win stated that her win is a stepping stone for greater things to come. She was also grateful to her parents for their unending support and prayers. The pageant, themed ‘Africanism’ was geared at promoting the just concluded Calabar International Carnival, hosted by the Governor of Cross River State, and also to promote Africa’s rich culture and values.